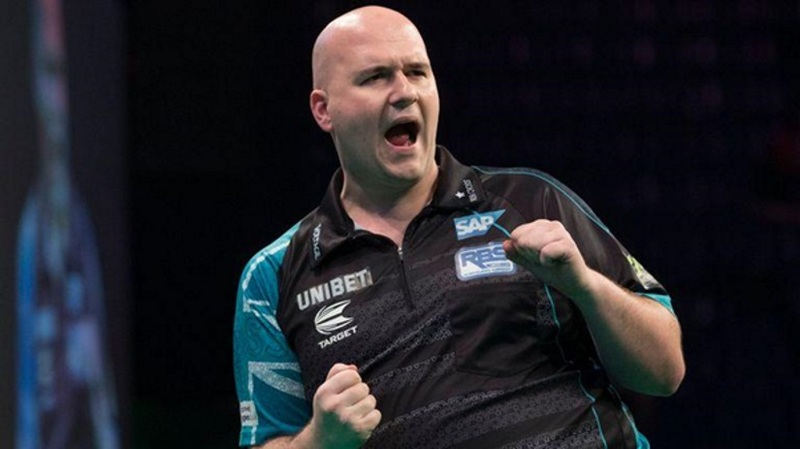 Rob Cross moved back to the top of the Darts Premier League after Michael van Gerwen was unable to match Voltage’s result during Night 10. Cross beat Londonderry’s own Daryl Gurney in Belfast, while MVG could only manage a draw in his match against Wales’ Gerwyn Price after fighting back from 5-1 down. Cross returns to the league’s summit after playing the role of party pooper against hometown hero Superchin, whom he beat in an impressive 8-4 victory. Former world champion Cross averaged close to 105, which proved too much for Gurney, who won the first leg but soon looked defeated. Feeding only on the few scraps left in the wake of Cross’s mistakes, Gurney struggled as his confidence deserted him before the Englishman put himself 4-2 in front. Voltage followed this up with back-to-back 177’s and a double on the six to further extend his lead. The match was soon over as Cross finished on the bull for 124 and climbed back to the top of the pile by a point as the players head to Liverpool this Thursday. Cross would have moved two points clear had Gerwyn Price not missed two match darts that would have given him his first career victory over Michael van Gerwen. In an entertaining 7-7 draw, The Iceman raced into a 5-1 lead courtesy of duel breaks of throw and looked like he would finally overcome the Dutchman at the 16th attempt. Price was good value for it too but couldn’t hold on long enough to prevent Mighty Mike’s comeback which reduced the margin to 7-6 and forced the Welshman to throw for the match. MVG’s throwing, particularly at the doubles, was so off on the night that he returned a poor 32 percent checkout rate, the worst of any player on the night. This was in contrast to Price, who only faltered when aiming for the 49 he needed in the last leg in order to win the match. Mensur Suljovic made it three wins in a row against James Wade after triumphing in a hard-fought 8-6 victory in the opening game of the night. The Gentle, whose famed slow, methodical style visibly annoyed Wade, initially found himself two legs down. The two rivals then matched each other’s game right up until Suljovic, who shot five 180s in the match, broke in the 9th before holding in the 10th to move 7-4 ahead. The Machine replied with a 137 to break back and maybe save a point. The Austrian had other ideas, however, and landed seven perfect darts as part of his finest leg of the match to take the contest and move above Wade into third place in the table. Finally, Peter Wright notched his fifth draw in ten outings after he tied with Michael Smith for the second time this season. Smith, who remains at the bottom, averaged just north of 100, which was 10 points greater than Snakebite, who is only one place higher in the league. The point did neither player a lot of good, although it is Bully Boy who will feel like he should have done better. Generally throwing impressively throughout the match, he opened up with a first-throw maximum before landing a kill-shot of 108 in the following leg. Despite his superiority though, Smith couldn’t get the break and failed move ahead from his opponent. Both players picked up their game in the latter stages, but the deadlock still couldn’t be broken and the spoils were shared, 7-7. Match one at the M&S Bank Arena in Liverpool pits Rob Cross against Peter Wright in a match that already looks decidedly one-sided. Snakebite badly needs a win to turn his lost season around. Despite his struggles, he has proven to be a hard man to beat, drawing half of his matches so far. Cross, though, boasts the better head-to-head record and is playing with much more confidence at the moment. So much confidence in fact that he is top of the table and is likely to still be there come Friday morning too. Next up is Gerwyn Price who is taking on Mensur Suljovic and is fancied to claim both points on Thursday. The Iceman came close to ending a 15-match losing streak against Michael van Gerwen last week, and despite a little wobble a few weeks back, has played a decent league season so far. Although Price will be gutted he didn’t nick the win, a draw was still a positive result and left him on the fringes of the top four as he pushes on towards London. Suljovic is already in the top four after he leapfrogged James Wade by beating him a week ago but Price has won 10 of their 14 meetings and could well make that 11 this week. James Wade and Daryl Gurney meet next with The Machine winning only won one of his last five matches including a loss last week. Superchin Gurney also goes into this week’s fixture off the back of a defeat and will be looking for revenge for week five’s whitewash suffered at the hands of the same opponent. Head to head, there is not a lot to split the pair, with Wade winning five and Gurney four so a close game could be on the cards this time. The result is likely to be closer than March’s drubbing, although the winning player could well be the same. Michael van Gerwen and Michael Smith close out the night with Smith still searching for the win he needs to climb off the bottom of the table. Hailing from St Helens, this is the closest thing to a home match for Bully Boy; it’s just a shame that he faces the World Champion at this stage of proceedings. That said, Mighty Mike was well shaken last week in Belfast and needed to survive two Gerwyn Price match darts before saving a point for himself. Smith should have won last week but could only draw against Peter Wright and has lost 27 of his 33 meetings with MVG, who should take all the points once again. All of which means that this week’s four-fold accumulator with Betway is as follows; Rob Cross, Gerwyn Price, James Wade v Daryl Gurney and Michael van Gerwen which pays 12.65/1. Sports writer Pete has been involved in online gaming for a number of years and has worked for some of the biggest names in broadcast and online media. A fan of Darts, Football, Rugby, Golf and Cricket among others, these days he prefers watching, writing and wagering over competing. Who Are The World's Best Darts Players? Most photos featured on this site are provided by the Professional Darts Corporation, which has granted us permission to use them.